For your exterior plaster projects, Rapid Set® Eisenwall® is the product of choice. Eisenwall is a premium hydraulic cement for exterior plastering, one-coat stucco and plaster wall repair applications. It can be applied on both wood and steel frame construction, and over nearly all substrates, new or retrofit. With a high quality finish and superior durability, Eisenwall outperforms plastic cement. Eliminate virtually all shrinkage cracking with Eisenwall. 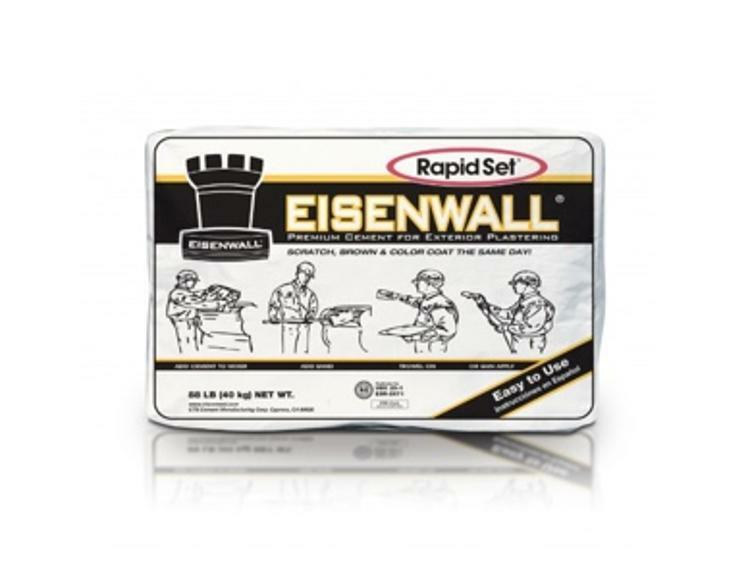 Apply Eisenwall the same way as conventional plastic cement by hand or machine (gun spraying). Scratch, brown and color coat Eisenwall in one day, and save time and money. One 88-pound bag covers 5 square yards at 7/8-inches thick.